"Aether welder," Rashmi said. With a whir and three clicks, the workshop assistant automaton clattered over. "Thank you." Rashmi's fingers brushed the automaton's tiny metal claws as she took the tool. "That will be all." It chirped twice and skittered back to the corner of the pristine Spire Inquirium. Rashmi's eyes followed as it went, longing, but there was no inquisitive look, no thought-provoking commentary, no reassuring presence. Rashmi sighed; how she missed her vedalken assistant Mitul. If only he could see the transporter now. He would balk at the towering archway that was orders of magnitude larger than the ring they had made. His eyes would blink in rapid succession, first one and then the other, as he examined the detachable modular core. It would upset him, surely, that he had missed the experimentation, but his dismay would be but a cloud passing over the sun as it gave way to the furious scribbling of entries in his logbook. Mitul never allowed his emotions to interfere with his work; Rashmi had yet to master that feat. Even as she welded the final piece of the aether modulator into place, her mood refused to rebound. Now that she had thought of him, Rashmi was relatively certain that nothing would buoy her spirits except the appearance of her friend at the door. But it was seeming more and more unlikely that would ever happen. It had been four weeks since she'd asked for Mitul to be brought on, and every chance she got, she reminded the functionaries of her request. But their response was always the same: "You focus on the invention, and let us take care of the rest." Glancing around, Rashmi wondered if any of the other inventors felt the same lonesome disenchantment she felt. She would have asked them if she could have, but conversation wasn't permitted during work hours. Tezzeret demanded an atmosphere of quiet, focused productivity. As he frequently reminded them, "Inane prattle will not be tolerated. Any one of you who prefers mindless gossip to invention shall be sent to join the witless masses outside of my Inquirium." The only discussion permitted was that pertaining to invention. But that had all evaporated the day after Tezzeret's first progress check. The sight of aerowright Sana's empty workstation dissolved any spirit of comradery that had been forming between the fair winners. This opportunity was the chance of a lifetime for each of them, but only one inventor's dreams would come true. Rashmi finished her weld and closed the access panel on the archway. Wiping her hands on her skirts, she stepped back to scrutinize the transporter as she knew Tezzeret would; she was determined not to be the next forgotten name at a vacant workbench. The integrity of the structure was sound, the supports were in place, and each one of the aether pipeline connections was reinforced. She glanced at the timepiece on her desk; he would arrive any moment. She told herself she was ready. I deserve to be here. She wanted to believe it. The Inquirium door whooshed open, and Rashmi's breath hitched. 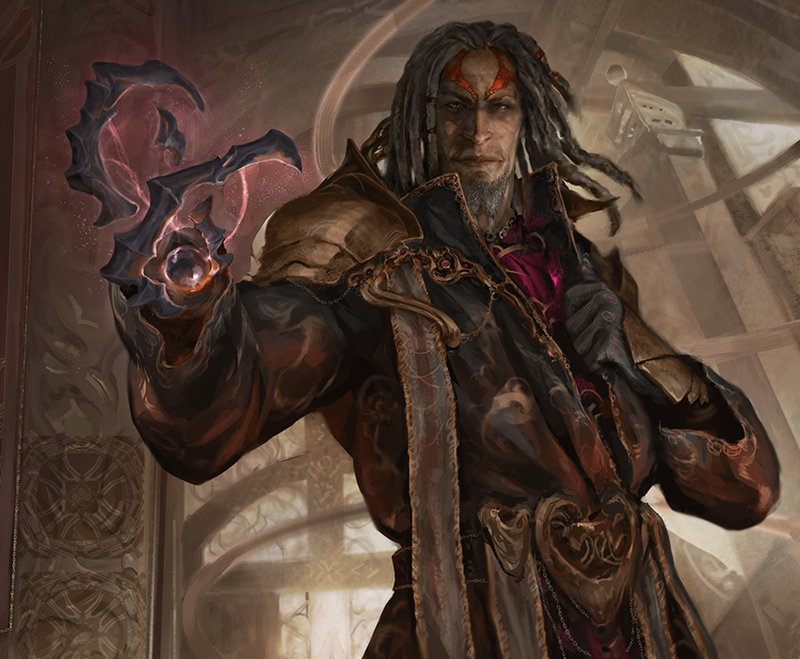 Flanked by a retinue of functionaries dressed in ornamental Consulate robes, Tezzeret strode in. His entrance elicited the same effect as shining a light on a clutch of feeding gremlins. All movement in the Inquirium halted. Every eye in the room snapped to focus on the man with the metal hand. He took a step back and tilted his head as though contemplating a piece of art. "The bearings are crushed. You said you had updated them so they wouldn't be crushed." Bhavin blanched. "Yes, Tezzeret, but that was under normal use cond—"
A collective gasp sounded from the other workstations. "But, Grand Consul, please, I—"
"Get. Out." Tezzeret pointed to the door with a long metal finger. "Take him." Three functionaries responded with an abrupt concerted movement not unlike a group of linked automatons. "Wait." Bhavin struggled against their grip. "My invention! What about my invention?" "This piece of garbage is not yours." Tezzeret kicked the automaton. "Anything made in this Inquirium belongs to the Consulate." "No!" Bhavin reached for the frame of the door, but the functionaries twisted his arm behind his back. "Please!" he cried. "It's all I have. Please, let me take it." His heart-wrenching plea hung in the thick grease-scented air as he was pulled into the hall. Rashmi reached for the towering metal frame of her transporter. She held tight, knuckles turning white, as though her grip could prevent her from being separated from her creation. "Disappointing," Tezzeret muttered. And then louder, "Progress! Is that too much to ask? You are all inventors, are you not?" As he strode down the main aisle of the Inquirium, eyes were averted like flies from a horse's tail. "You mean to tell me this is the best this world has to offer? I have the winners of the wondrous Inventors' Fair here, and what do they make? Heaps and heaps of rubbish." He rounded on Rashmi's workstation. "You're supposed to be geniuses, but I have yet to see any evidence that you're anything more than a roomful of idiots." His eyes were wide, red veins bright, and they locked directly on Rashmi. "Show me progress, or get out!" Rashmi stared up at the heaving form of her patron, unable to move, unable to breathe, until finally, her mind managed to pull together enough conscious thought to quietly whisper, I deserve to be here. She took a breath. She was prepared for this, for his temper; it was nothing new, and she knew what she had to do. She had to focus on her invention; her work would speak for itself. With some effort, she turned away from Tezzeret. It's just you and me. She gave the transporter archway a final squeeze. Let's show him what we've got. Rashmi cleared her throat. "The scaling-up is complete. You're looking at the new frame, which, as you can see by its size, will be capable of moving something with the dimensions of a Gearhulk, as you requested. The metal is triple-reinforced to withstand the sheer friction imposed by non-linear transport of solid matter. The structural aether scaffolding has been expanded to accommodate the increased volume of transport. Preliminary trials have met with much success." When she was finished, she drew a breath, and held it. "There is some progress here." Tezzeret's voice was clipped, but free of rage. Rashmi permitted herself to exhale. But it was a false sense of security she felt; as quickly as it had faded, Tezzeret's tantrum resumed. "But some progress is not enough! What do you people do here all day? You're wasting my time. Where's the modular core?" Rashmi steeled herself; she knew her answer wouldn't satisfy. "I've begun work on it, but—"
"Begun? Begun! It should be complete by now." Rashmi recoiled. "There hasn't been time. These past weeks have been devoted to scaling up, and the modular core requires—"
"Excuses." Tezzeret waved his flesh hand. "Not even very good ones. You act like each simple request I make is an enormous impossibility. But I am your patron. And you are the winner of the Inventors' Fair. The WINNER! I demand the most from you. Not unfairly. I'm sure the others would agree." No one uttered a word. "I need the modular core complete. It's a priority. Do you understand?" "Yes," Rashmi managed. "There are a few more issues to work out, but it should be on track to be completed within the timeline you provided." "Oh, so now meeting the minimal requirements is something to brag about?" "That's not—no. It should be done ahead of schedule. I just have to manage the feedback that occurs when I decouple the external focal point from the main transporter unit." "The feedback?" Tezzeret's brows knitted. "And here, for just a moment, I thought you were actually a capable inventor. Your mind is so underdeveloped it's practically useless." He ran his metal finger over the filigree of the transporter; the sound made Rashmi's teeth ache. "What you're working with here is nonlinear transport, but you've been thinking in terms of linear laws this whole time. Consider this for a moment. In a multidimensional space, what happens to the friction?" Even if she had tried to stop it, Rashmi's mind would have ruminated on his question; she couldn't help but ponder a scientific quandary. At first she didn't see what he was getting at, but then it hit her; she gasped in spite of herself. "Ah, and there it is, she finally gets it," Tezzeret drawled. Rashmi hardly noticed his scoff; she was lost deep in thought, on the precipice of a breakthrough. 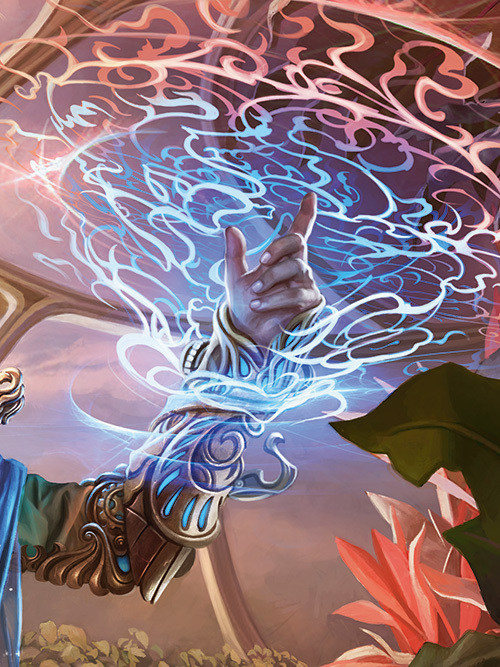 "If I insert an attenuator into the aether-loop, that will allow the external focal point to relay with the inception and target points without overloading the power capacitor, and—"
"And it will work," Tezzeret said. "Of course it will." Calculations were streaming through Rashmi's mind. "We'll need more aether. At least twice as much to accommodate for the increased spatial dimensionality." "Fine." 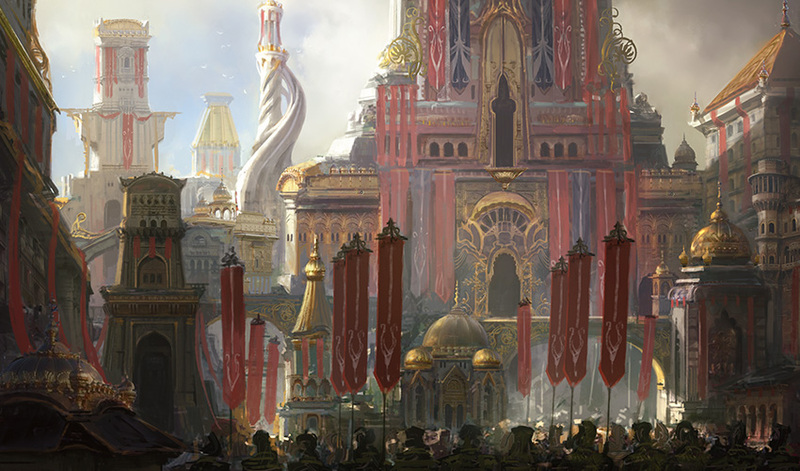 Tezzeret looked to a cluster of functionaries seemingly at random. 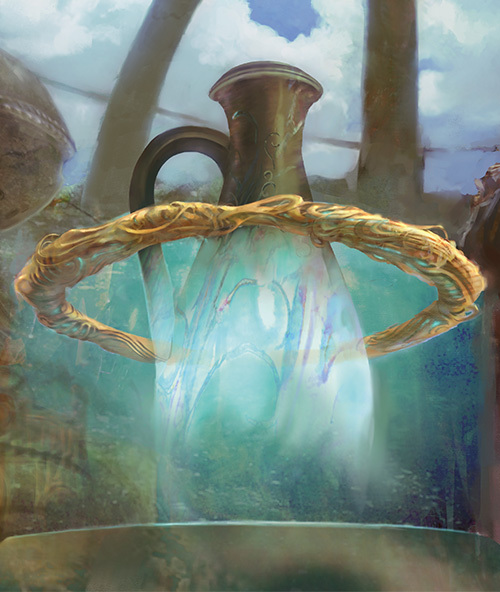 "Increase the supply of aether to the Inquirium three-fold." "Of course, Grand Consul." The nearest functionary bobbed his head. "Ahem." A second functionary stepped forward, clearing her throat. "It should be noted that an increase of that scale will require the rerouting of a significant portion of the supply that is currently allotted for various other zones. That could be a problem if—"
"I see no problem," Tezzeret snapped. "No more EXCUSES!" The veins in Tezzeret's temples pulsed. He took a breath and lowered his voice. "Listen to me. There is nothing more important than the work that's happening right here in this inquirium. This is the Consulate's number one priority. Do you understand?" The functionary smoothed her robes. "Of course, Grand Consul, but—"
"Leave." Tezzeret waved to the door. "Leave?" The functionary stepped back dismayed. "Yes. You are dismissed." She stood frozen. "Your services are no longer required." Still she did not move. "Take her out." Tezzeret signaled, and the functionaries nearest her jumped to act, gripping her by the arms and escorting her. "And increase the aether supply." Rashmi gaped as Tezzeret wheeled on her. "If the zones need the aether, I can—"
"No!" Tezzeret slammed his metal hand into the archway of the transporter. "This is the only thing that matters. You will have the aether you need to operate on an accelerated timeline. When I return for my next progress check, you will move that piece of rubbish," he indicated Bhavin's massive automaton, "across the Inquirium." Rashmi swallowed, attempting a nod. All the strength drained out of Rashmi. The word "terminated" rang in her head. Whispers crawled up the back of her neck, and stray glances followed her as she moved to her desk and sank into her chair. Was it supposed to be like this? There on her desk, propped up against the wall, sat her original transporter ring. She ran her fingers along the filigree. When she'd set it there, she'd intended for it to be her inspiration for her work here. She had been so hopeful, so proud in that moment. It had felt like her dreams were about to come true. And now? Rashmi exhaled, long and slow. She'd set out to change the world, and that was still her intent. This was her chance. She would not waste it. If there was nothing else positive to say about her patron, Rashmi could at least say one thing: she had never been pushed this hard before. She had often wondered over the course of the last few weeks where she would be—where the transporter would be—if she had not been under the pressure Tezzeret so adeptly applied. If she hadn't adjusted her schedule to work through three out of every four nights, if she hadn't begun eating her meals in the form of solid bars delivered by automatons who interrupted her work only long enough for her to take a bite, if she hadn't sufficed with the minimal number of showers possible to maintain a level of fetor just above that of a bandar's, she would not be here, right now, about to insert the final component into her masterpiece. Rashmi was hanging in a harness up near the top of the transporter arch, aether-welder in one hand and sensor module in the other. The Inquirium was silent except for the hissing of heated aether. The day after Tezzeret had made his last appearance, all the other inventors had been moved out of the Spire Inquirium. "To a new location," one of the functionaries promised, but Rashmi wasn't convinced. She would have liked to say she missed them, but in truth, she didn't really notice their absence. The silence and isolation was the same as it always had been. The only person she missed was Mitul. Her welding lines met, having come full circle around the sensor, and Rashmi flicked the switch to turn off the flow of aether. As the heated metal cooled, she leaned back in her harness, examining her work. That was it. She was done. It seemed impossible, but it was true. "It's finished." The words were no more than a breath, but they filled the whole of the Inquirium. A sudden flush blossomed behind Rashmi's cheeks and a thrill welled in her chest. "It's finished!" She let her head fall back and spread her arms wide, hanging in her harness. The springy cable supporting her bounced with her giddy laughter as she dangled in the shadow of her creation. She let out a whoop. This thing she had made was beautiful. In her scramble to complete it, she had never stopped to look at it before, not like this. The curve of the metal, the flourishes of filigree that supported glowing blue aether pipelines, the enormity of it. It was enchanting; it was overwhelming; it was everything. A ray of sunlight danced across the perfect line of her final weld and Rashmi allowed herself to smile. As her lips curved upward, she realized that was something they hadn't done in a while. It was time to smile now. It was time to breathe. It was time to—all at once, her entire body tensed. "The sun!" It was morning. The morning of the progress check. Tezzeret would be on his way. With impatient hands, Rashmi unclasped her rope, and rappelled down, her feet scrabbling to find purchase before even touching the ground. "Aether grip!" She called. The assistant automaton jumped up and scuttled over to the shelves at her command. The transporter may have been complete, but it wasn't ready for the demonstration. She had yet to set the target location for transport. Her tests had sent small items like tweezers and wrenches into a box next to her desk, but if she sent Bhavin's massive automaton there, it would destroy the box, and crush her desk, and possibly break through the window behind it. It would be a disaster, one she definitely wanted to avoid. The little automaton skittered over and stretched upward, holding out the aether grip. Rashmi didn't bother to take off her harness, she grabbed the tool, kneeling down by the modular core and plunged her hands into the inner aetherworks. The basic principle she would be using to move matter was the same principle she'd used in her original transporter; the inception point was the towering transporter archway, just as it had been the transporter ring, and the target location was wherever she selected in three-dimensional space. The difference between the archway and the ring was that the archway depended on the auras of multiple other phantom dimensions to provide the pathways for conveyance from inception to target. That meant faster transport of objects of exponentially greater volumes. Fingers extended, Rashmi reached into the multidimensional aether projection within the modular core, feeling out the scaffolding, a one-to-one representation of the aether patterns of the Great Conduit. The part she could feel was the section of the Conduit immediately surrounding her in the Inquirium, with everything else beyond coming through as fuzzy and out of focus. That was fine for now; all she needed was to thread the target location on the other side of the Inquirium into the core. And she needed to do that quickly. "Come on, come on." She felt around for the essence of the aether tether she needed; it was a matter of working both with her physical perception of touch and her deeper awareness of the Conduit. When she closed her eyes, she could see through her mind's eye. It was as though she was looking at a faded blue ethereal portrait of the Inquirium. She manipulated the projection narrowing in on her focus point, until—"Yes!" When her fingers brushed it, it was as though she was there; for a half of a heartbeat, she felt like she was standing on the other side of the Inquirium. "Now to bring you through." She guided the insubstantial projection, winding it through the phantom dimensional scaffolding in the modular core, pulling it toward the anchor that represented the inception location. Once she connected the inception point with this target location, the transporter would be capable of moving Bhavin's automaton across the Inquirium. In truth, it was much less about actually moving anything and more about collapsing the spatial dimensions to make the two locations coexist. What a thrilling prospect! Halfway through the inner aetherworks, the projection for the target snagged on something. Rashmi nearly lost her grip. "No, no, not now." She twisted the projection, coaxing it with gentle tugs. It was caught on one of the phantom dimensions. "We don't have time for this." She tugged harder, harder, hard—her hand slipped. Suddenly everything felt wrong. She was gripped by the sensation of severe vertigo, she tried to pull back, but whatever had a hold on her was too strong. It was like plunging into a bath of ice water. She would have screamed if she could have found her voice—if she could have identified the place within her being that a voice was supposed to come from. But she couldn't find her lips, nor her lungs, nor any other part of her body. All she knew were the multitudinous dimensions. They were no longer phantom, no longer variables in an equation. They were real. And there were so many. Rashmi felt so small, and yet her essence had the sensation of enormity. She must have hung there, suspended, overwhelmed by awe and wonder, for some length of time, but how long, she had no conception. Time was not. And then she was moving. Or at least her surroundings were shifting. The sensation of movement was absent, but the cues were compelling. She was looking out at a cityscape, only none of the buildings looked familiar. The shapes, the colors, the architecture, it was all so curious. And then she was in a forest, or perhaps a jungle, thick with vines and wide-leafed plants that seemed to compete with each other for dominion. She glimpsed a massive rock cut into the shape of a diamond; it hung in the air, suspended as though gravity didn't apply. Then a wide open sky, filled only with deep purple clouds, and a mountain range capped in snow through which yellow flowers grew. The images—impressions really—were coming faster now. One blended into the next, quiet hearths, vast deserts, bustling marketplaces filled with unfamiliar people and wares, the maw of a beast, a star-filled sky. More than she could count, more than she could ever know. Rashmi was gripped with emotion; this place, these places, she had always known they were out here. Throughout her years of experimentation with matter transport, she had felt them, dangling just beyond her reach. She had believed even though she had not had any evidence to support her theories. And now here she was. Something swelled deep inside, something that made her feel both more alive and more fragile than she had ever felt. It brought with it the sensation of tears, though she had no capacity to shed them. She could have stayed in this wondrous place—these breathtaking places—forever. From somewhere, she heard a sound. It repeated. Regularly. It was a beat. Each intonation reverberated the core of her essence. As they crystalized, it became clear that the tones were sharp. Angry. Painful. They were everything this place wasn't. They were tugging on her, demanding that she have ears to hear them, that she have a spine to feel a shiver, and hair to raise on end. Each beat pulled her further from the place she was, further into the body that she had almost forgotten. Further away. And then she was Rashmi, the elf, kneeling on the floor in the Inquirium, tears streaming down her cheeks, her hands deep inside the aetherworks of the modular core. The sound resolved. It was the clipping of footfalls. Staccato and vile. Tezzeret. The blood drained from Rashmi's cheeks. He was coming. With a swift tug she yanked her hands out of the core, reeling back as a deep creaking resounded from within. The core's aether-fuse sparked. She shielded her eyes to block a burst of aether that shot up at her face. "That is one of the last things I wanted to see this morning." Tezzeret parked himself over Rashmi, a handful of functionaries flanking him on either side. "My inventor uselessly sprawled on the ground covered in aether." "Grand Consul." Rashmi could barely contain her thrill over what she had just seen. "I've had a breakthrough." Disjointed, fragmented words began pouring out of her mouth as she staggered to her feet. "What's out there is—the phantom dimensions. There are more realities. The buildings. They weren't—I've never see anything like those plants. They can't be from here. There's something more out there. I've felt it before. Mitul did too. Mitul! We have to bring him here. He'll understand this. He had theories. Brilliant theories. The possibilities—this is not just about matter transport anymore; this is about expanding our understanding of—of—existence." From somewhere deep inside the bowels of the man standing before her, there came the sound of rumbling, low and rolling. It started out soft and developed into something sinister that felt like it was crawling up and down Rashmi's insides. Tezzeret was laughing, she realized. Laughing at her. But why? "Oh, how amusing it is to see the way small minds work when confronted with things so much larger than they were meant to comprehend." Tezzeret shook his head mirthfully, but then suddenly his whole demeanor shifted and eyes narrowed. "Is the transporter finished?" "Good. You finally did something right." "But, this isn't about the transporter anymore. Don't you see—"
"Don't you see?" Tezzeret leaned in. "No of course you don't. How could you? Your perspective is so infuriatingly limited." Tezzeret signaled to his functionaries. "Bring that garbage construct over here. It's time to see what this can do." "Yes, sir." The functionaries quickly moved to Bhavin's workstation. "Wait." Rashmi couldn't believe what Tezzeret was doing. "It's too dangerous. We don't fully understand the stress we might put on the phantom—"
"You are dismissed." Tezzeret waved his flesh hand. "What?" A jolt of alarm gripped Rashmi. "You completed your task." 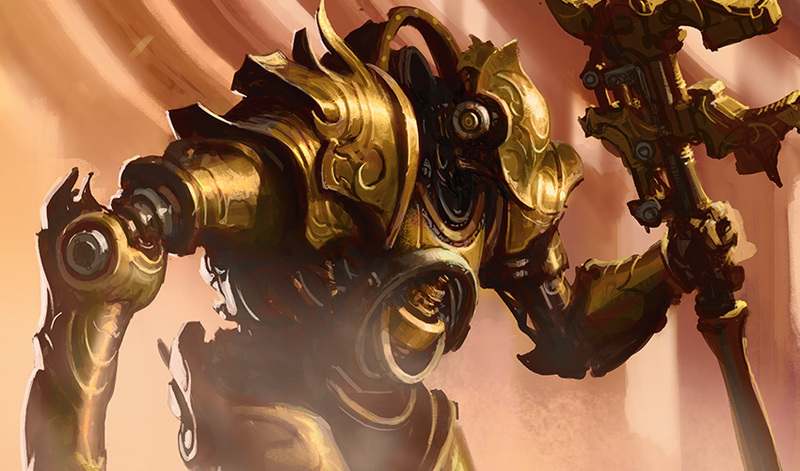 Tezzeret caressed the filigree of the transporter with his metal claw. "This beautiful creation is now mine. And thus I am done with you." "The construct, Grand Consul." The functionaries rolled Bhavin's massive construct into place under the archway. "Good. Now, take the elf out." "Yes, sir." The functionaries moved to surround Rashmi. "Wait." Rashmi's heart was hammering. She had to do something. "It's not ready." She was concocting a plan as she spoke. If she could stall, if she could disconnect the core from the phantom dimensions, then he wouldn't be able to hurt them. "An aether fuse blew." She held out her aether-stained arms. "Just before you came in." Tezzeret's back straightened. "You said it was finished." "It was. It is. I just need to install a replacement part." "You lied to me." It wasn't a question. "No one lies to me." The pounding in Rashmi's chest surged down into her gut, but she held her ground. "I didn't lie. It is finished. It just needs a minor adjustment." "I think you misunderstood." A muscle in Tezzeret's left cheek twitched. "No one lies to me because I end the lives of those who do." Suddenly Rashmi couldn't breathe. It was as though an aether-vice had closed around her gut. "I have been more than patient with you. But my patience has run out. That means your life is about to do the same." 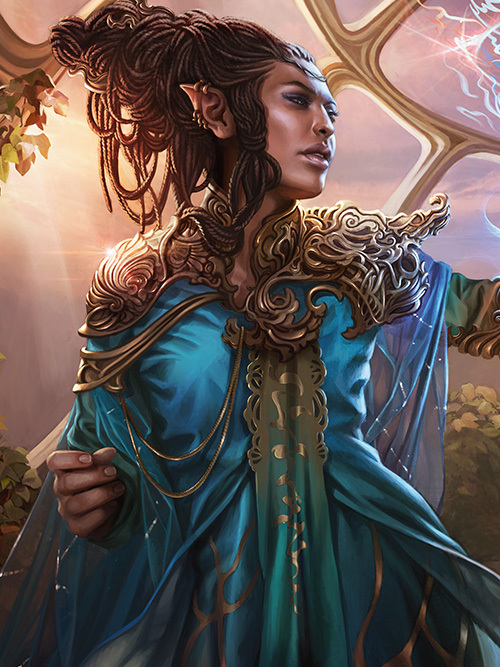 Rashmi backed toward the archway, computing how long it would take to yank the projection of the Conduit out of the modular core, but before she could act, Tezzeret lifted a finger, and the firm grips of two functionaries locked around her arms. 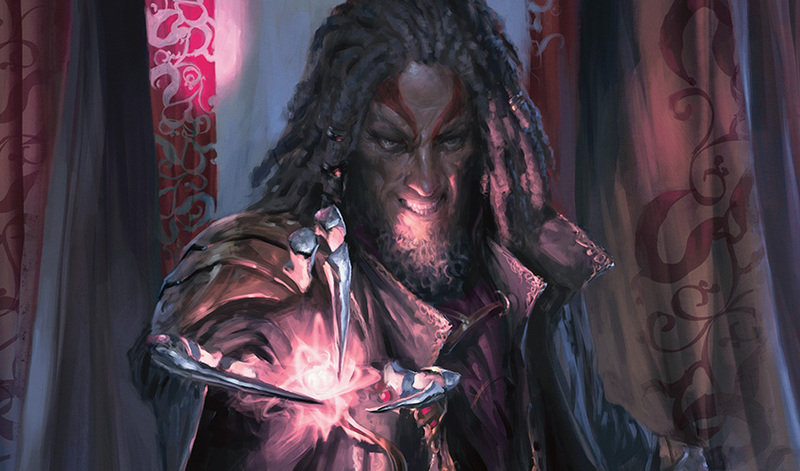 Tezzeret strode forward, eyes locked on Rashmi. "Fix it. Now. If you do, I might consider allowing your limited little life to continue." His words made her panic, but they also strengthened her resolve. It was impossible to deny the type of man Tezzeret was any longer. She had been such a fool. All this time the signs had been there. She'd seen the way he'd treated the others—the way he'd treated her. But she'd tried to convince herself that there was nothing wrong. She had wanted, so desperately, for this to be her chance to change the world, so she had ignored his temper, she'd pretended she didn't see the violence. She'd told herself that he was only pushing her because he wanted the best for her. She'd told herself he was a good patron. But in truth, he was a monster. Now, it was to her to protect those places out there from this monster—even if it meant her life. Rashmi took a deep breath. She would not fix the transporter for him, she would destroy it. "I'll need my tools." She moved to free herself from the grips of the functionaries. "Do you think I'm a fool?" Tezzeret spat. Rashmi froze. "I can see your small mind working, I can smell the sweat of your intent. You want to destroy it." Rashmi tried to conceal her shock at his accuracy. "I know you do. So, go ahead. Do it. But know that if you do, I will kill you, then I will bring your little friend—Mitul, I believe was his name—to complete the transporter, he should be familiar enough with your work, and then I will kill him too." "No!" Rashmi struggled against the grip of the functionaries. Not Mitul. Not gentle, honest, caring Mitul. "You can't!" "Finally, it seems I'm getting through to you." Tezzeret sneered. "Then let's make sure you stay motivated." He called out two functionaries with a quick stab of a flesh finger. "You two, retrieve the vedalken, Mitul. Now." "Yes, Grand Consul." The functionaries hurried out of the Inquirium. "No!" Rashmi fell into panic. Her breath was coming in quick gasps. The room tilted first to the right, and then to the left. If the functionaries hadn't been supporting her by the arms, she wouldn't have been able to remain upright. "If you're not done by the time they return with your friend, you both die." Tezzeret nodded to the functionaries who held Rashmi. "Release her." The gleam of the polished floor. The joint of an automaton. The filigree of the transporter. As Rashmi staggered forward, she saw each aspect of the Inquirium as separate, isolated. Her mind refused to put the pieces together; it was too brutal to think of as a whole. "Well?" Tezzeret loomed over her. "What are you waiting for?" She wasn't waiting; she was paralyzed. She could only think of Mitul. He would be sitting at his desk in the beetle inquirium this morning. He always got in early. She wondered what brilliant device he was working on now. Heat welled in her tightening throat. He would have no inclination that Consulate forces were about to descend on him. No warning. No explanation. They would be violent and loud. They would hurt him. It wasn't fair. Mitul had never hurt a soul. And now he would suffer because of her. No. He wouldn't. He didn't have to. Move. Rashmi told herself. For Mitul. Move. Mind reeling, she stumbled toward the supply room. There had to be a way, there had to be something she could do to save both: the dimensions she had seen and her dear friend. She forced her mind to analyze the situation, to think of the problem Tezzeret had presented her with as constraints on a logic puzzle. But no matter how she approached it, she got the same result; there was no way to save both. She would have to choose. And she would choose Mitul. I'm so sorry. The words were meant for all the life in all the places she had seen. Perhaps whoever was out there would understand, perhaps they would have done the same for a friend. Clinging to the door of the supply room, Rashmi searched the gleaming golden cubbies for a new aether-fuse. Mechanically, she selected the fuse she needed, carried it to her desk, opened the logbook, and recorded the identification number. A tear rolled down her cheek. She wiped it away, but the second and third splashed quietly onto the metal ring of her original transporter, still sitting propped on the back of her desk. The sight of the ring brought on more tears. How did we get here? This wasn't what was supposed to have happened. None of it was. If someone had told her back in her beetle inquirium that this is where she would end up—suddenly Rashmi's mouth went dry and her palms began to sweat. The beetle Inquirium...She had solved the puzzle. Her hands were already moving, ripping off a corner of a page in the logbook. She knew Tezzeret must be watching her from afar, but she didn't dare turn around to check. If he realized what she was about to do, he would kill her, there was no question. But if she pulled this off without alerting him, she might be able to save Mitul's life. That was enough to make her risk it all. She scribbled a note, barely legible: You're in danger. Run. Don't let them bring you to the Spire. She crumpled it into a ball. "What are you doing?" Tezzeret's voice stopped her heart. "Running a calculation." The confidence of her words surprised her, as did the volume of her voice. "You said you were going to insert a replacement part." Tezzeret's impatience was evident. His footsteps clipped across the floor, coming closer. With a flick of a switch, Rashmi turned on the transporter. "You said nothing of calculations. Did you lie to me? Again?" "I have to ensure the fuse doesn't short a second time." Rashmi's voice was forceful. She had found her courage in her need to protect Mitul. "I can't afford for the trial to fail. You made that abundantly clear." She knew her retort would irk him, but that's what she wanted. Distract him from the transporter ring. "I'm beginning to doubt your instinct for self-preservation." He was rounding past Bhavin's old desk; she could tell by the way his footsteps echoed. One hand scribbling in her logbook to keep up the farce, Rashmi used the other to open the transporter's control panel and reach inside. There were only a few stored target locations, so it was simple to find the thread of aether that remembered a path back to the beetle inquirium. It was the target of their first successful matter transport; she'd never forget it, and neither would the ring. She locked the thread into place and clipped the panel shut. Please be there, she silently begged of Mitul. Please see this. "Enough calculations." Tezzeret's metal fist came down on the desk to her right. "It's time for the demonstration." His breath was hot on the back of her neck. Her hand was poised over the ring, but if she dropped the paper now, he would see. She would have to distract him, again. She took a breath, stealing herself. "It's time when I say it's time. I am the inventor." "WHAT DID YOU SAY?" Tezzeret's voice sounded as though it were coming through an amplifier. She had gotten what she wanted, he was distracted. He slammed the cover of the logbook shut, narrowly missing her fingertips. Rashmi feigned a gasp, while at the same time dropping the ball of paper through the ring. It disappeared. Grabbing her by the harness that was still buckled around her waist, Tezzeret spun her around to face him. "I thought I made it clear before. You are nothing. NOTHING." Spittle flew out of his mouth dusting her cheeks in a spattering of hot dew. "You are here ONLY because I wanted you to be. You are alive ONLY because I have allowed it. You will do as I say, or I will END you." He didn't wait for a response; he dragged her by the harness back across the inquirium to the transporter, where Bhavin's automaton stood under the arch ready for the demonstration. Rashmi didn't struggle. There was no reason to delay any longer. She had done all she could do; she'd given Mitul a chance to escape. Whatever came next was between her and this monster. "Put the part in!" Tezzeret threw Rashmi to the ground. Her knees hit the polished floor with a thud. Tears sprang up behind her eyes, but she blinked them away. She wouldn't let him see her cry. No. Not this man. Not this man who had told her she was nothing. Who had insulted her genius. He was the one who was nothing. He may have had power and control, but those were only acting to conceal the truth of what he was—or rather what he wasn't. He lacked everything that mattered. His was incapable of the science that came so naturally to her. He could never have made this transporter. That's why he had brought her here. He needed her. He was a worthless egomaniac who would fail without her. And she wasn't going to let this worthless man kill her. What she needed to do only took a few moments. She inserted the aether-fuse and tweaked the necessary settings within the modular core, connecting the inception point with a stored target location. Then she loosened the connection just enough that it would ricochet in response to the surge of transport. "It's ready." She stood, checking the clip on her harness. It was tight. "Stand back." Tezzeret shouldered her aside. "I'll be the one to operate the transporter." Rashmi bit her tongue to stop herself from thanking him for his predictable arrogance; it was exactly what she was counting on for this to work. She took a step closer to the long windows her eye on the nearby pulley system. 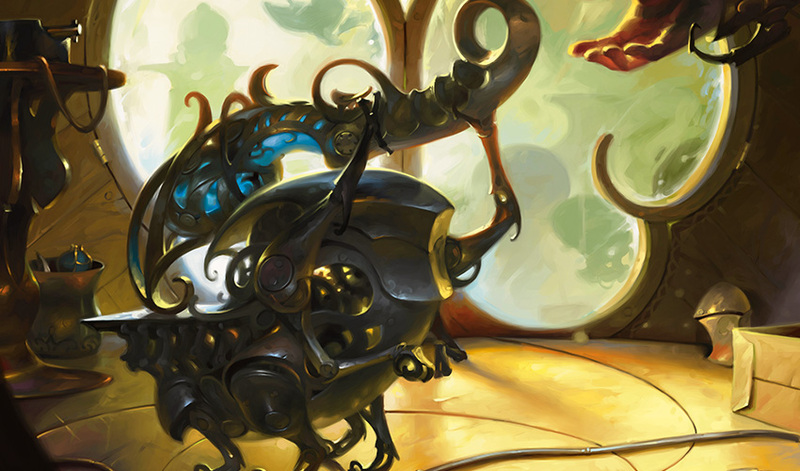 Tezzeret proudly thumped his metal claw on Bhavin's automaton, which stood under the transporter's arch. "It's time." He stepped to the side and grabbed hold of the lever on the operation panel. "This moment marks something impossible for you to comprehend. This is my moment." Tezzeret pulled the lever. Rashmi inhaled. The automaton disappeared. Rashmi exhaled. The fuse inside the modular core blew, shorting it out, and at the same time, the automaton reappeared—on top of the metal box she had used so many times before as a target location. Too big to fit, Bhavin's masterpiece crushed the box, crashing through the frame of Rashmi's nearby desk, and shattering the pane of the enormous glass window behind it. The change in pressure and the gusting aether winds sucked papers and tools out into the sky high above Ghirapur. "WHAT DID YOU DO!?" Tezzeret was livid; he stormed toward her, covered in aether from the blown fuse. But Rashmi was prepared. She clipped her harness to the pulley system's cable. Before his obtuse mind could work out what was happening, she sprinted to the gaping hole and leapt out into the swirling aether beyond. Everything that happened next, happened on instinct. She plummeted through the air, wind whipping up into her open mouth, stealing her breath and burning her lungs. She closed her mouth. The street below resolved through the freezing tears streaming from her eyes. She closed her eyes. The springy cable above her went taut, and she felt the elastic tug. Her body flung up and then bounced back down. And then again. One more time. She opened her eyes as the bouncing subsided. She was hanging just above the roof of a Consulate cruiser. She reached for the clip on her harness, forcing her trembling fingers to unlatch it. Her legs didn't respond in time to get under her, so she fell flat on the gleaming metal roof. Get up! She half crawled, half rolled off the top of the vehicle, her shoulder hitting the pavement first. There was commotion all around. People shouting. Sparks flying. Thopters buzzing. And from far above, Tezzeret shouting. Rashmi pushed herself to her feet and ran. She didn't know where she was going, but she knew she had to move. Get out of there. As far away as possible. Away from him. Her legs ached and her lungs screamed, but she would never stop. Never. Suddenly, a wall of metal sprang up in front of her. She dodged, turning left. Another wall. This time she slammed into it before she was able to adjust her course again, running another direction—into a third wall. She spun around. She was surrounded. "NO!" She slammed her fists into the metal. "No!" She wouldn't let him win. Hands took her by the shoulders, spinning her around. Rashmi lifted her fist, ready to fight. Ready to kill if that's what it came to. "It's all right, Rashmi. It's me. You're safe." Rashmi blinked. Nothing made sense. How? Where? "Saheeli?" "We're inside my construct. It's taking us someplace where no one can find us." Rashmi could feel movement below her feet, which were no longer on the street but on a metal floor. "It's over, Rashmi. You're safe. You're safe." Saheeli repeated the words until Rashmi's breathing slowed enough for her to speak again. "Mitul?" She croaked out her friend's name. Rashmi fell into Saheeli's arms, the tension finally going out of her. "That was quite the dramatic exit." Rashmi glanced up to see a strange woman dressed in black. "It was amazing," Saheeli said. "Personally, I'm a bit disappointed," the woman in black said. "I was promised I could have a little fun with Tezzeret." At the mention of his name, Rashmi's insides hardened. "Saheeli," she gripped her friend's arms. "He has the transporter—only it's not just a transporter. You were right. I didn't know the implications of what I was making. But I think he did. He must have known, just like..." Rashmi trailed off, looking to Saheeli. "You knew." She took a step back, feeling off balance. Her mind was working through the pieces she barely dared to put together. She looked from her friend to the metal that had sprouted up around them. She scrutinized its unique colorful gleam. Then her eyes moved to the woman in black. She took in her flowing dark skirt, unlike any fabric she had ever seen, and the lines on her skin, faint but purposeful, a language Rashmi didn't know. Her heart beating quick, she looked back to Saheeli, but this time she truly looked, dropping her perception deep into the aether. It was more a feeling than anything, and once she felt it, she knew she had felt it before. When he was in the room. Suddenly Rashmi felt very strange, very small, very scared. "Saheeli. You knew." Saheeli didn't say a word. The construct jerked to a stop. "Finally." The woman in black got up. "It's about as comfortable in here as in one of beefcake's meetings." She looked to Saheeli. "Well, are you going to let me out?" With a simple gesture, Saheeli parted the solid metal, and the woman in black stepped out into the bowels of what looked to be a dark warehouse. Saheeli cleared her throat and turned to Rashmi. "They'll all be waiting for us." "Who?" Rashmi's voice echoed in the stillness, as unsure of itself as she was. "What's going on, Saheeli? Where are we?" "Welcome to the renegade movement, my friend. I have much to tell you."